Joseph is a second-year music student at St Catherine’s College. Whilst at school, he studied oboe and conducting at the Junior Royal Academy of Music with Philip Harmer and Howard Williams respectively. In 2014 he set up his own orchestra in London which has provided him with the opportunity to work with the internationally renowned oboe soloist Nigel Shore, with whom he performed Bach’s Oboe d’Amore concerto, and to conduct Sibelius’ epic Second Symphony in the Blackheath Halls. He has conducted members of the Junior Royal Academy of Music at Cadogan Hall and has conducted two of Gershwin’s Overtures with the Eltham College Community Orchestra. 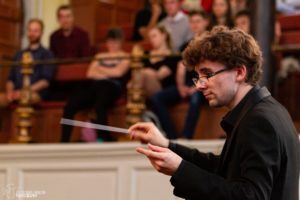 He currently studies conducting with Toby Purser, and is the conductor of the Oxford University Philharmonia.